Situated on the outskirts of Freetown, on the main road, the Waterloo Disabled Village was constructed from the ground up for to help and care for children of disabled parents. Here on land that was purchase, the mission built housing for the disabled and their families, water wells for drinking, cleaning and growing fruits & vegetables, a medical Clinic, a small school for the children of the disabled and the unfinished church. 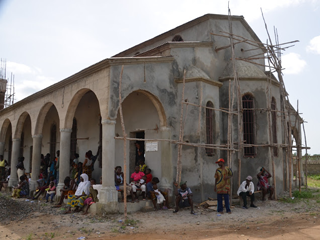 Following Christ’s words from Matt:25, the Holy Orthodox Diocese of Sierra Leone under the stewardship of Fr Themi gives freely of Faith Food and Education to the lowest of the low.